Happy Fourth of July! What a beautiful sunny day it is to celebrate America's birthday. I just had some barbeque and fixed myself a mojito-like drink from the fresh mint in my little garden. On that celebratory note, I'm posting the second part of my vacation: Arches National Park and Canyonlands National Park. The names are quite self-explanatory. 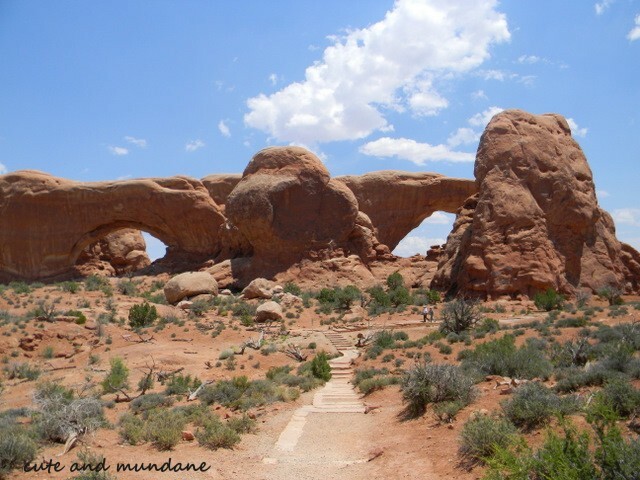 In Arches, you will see stone pillars and arches. 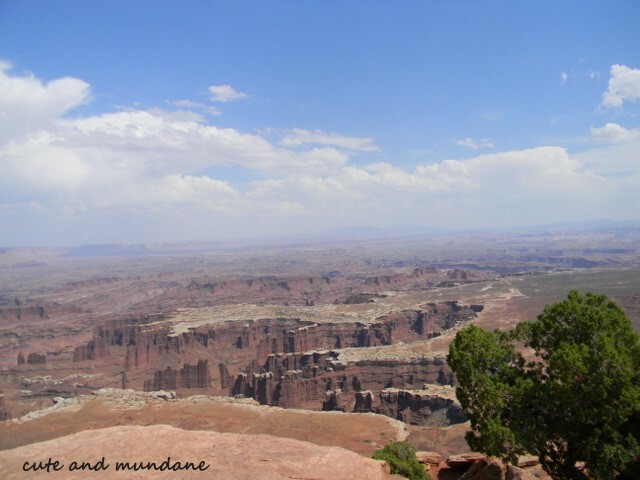 In Canyonlands, you see a vast numbers of canyons. Far from the cool forest of Yellowstone and Grand Teton, these two parks are borderline southwest and characterized by a more desert climate that reaches 100F well before midday. 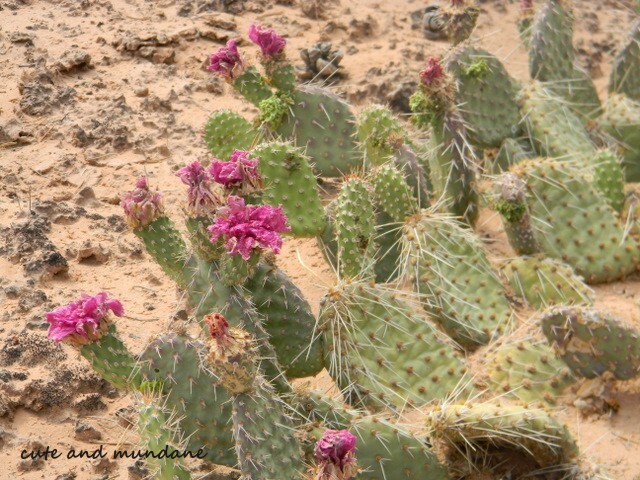 We saw a numerous patches of prickly pear cacti. Most were finished flowering, however I did manage to find remnants of pretty pink flowers in one patch (above). 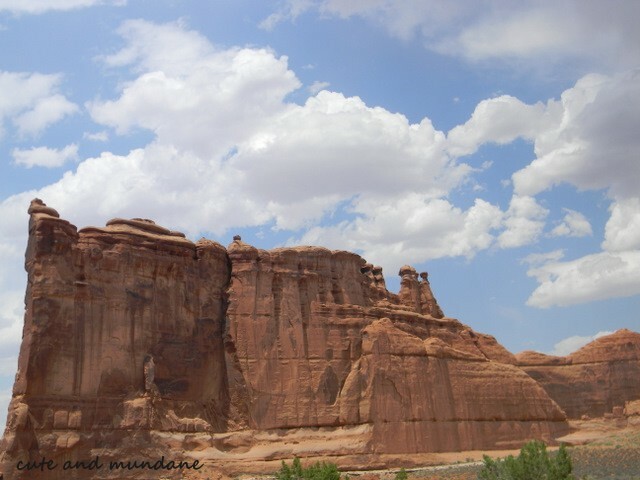 The picture below is a landscape at Canyonlands. Most of the park is atop a mesa, and you can look out on the edges. The canyons stretch for much further than the camera's lens can see. If you're afraid of heights like me, it's a pretty scary yet awe-inspiring experience. This is the courthouse formation at Arches NP. It does look foreboding and courthouse like, doesn't it? It is guessed to have been part of an old arch. Arches form and break throughout time. 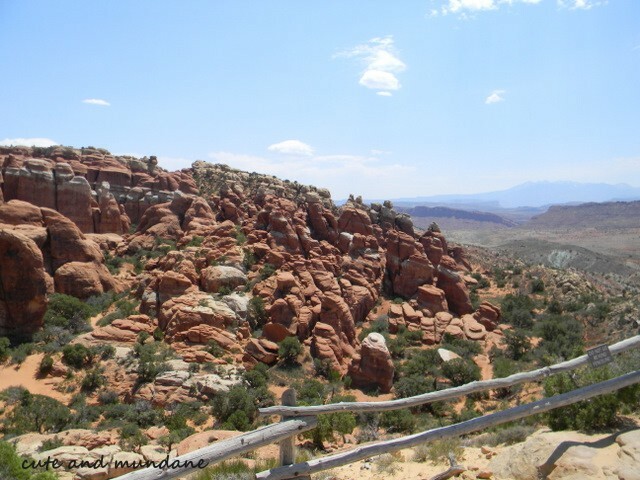 This is the fiery furnace in Arches NP. Towards evening the red rocks glow, giving the appearance of embers. Ironcially, though, this is one of the shadier and hence cooler parts of the park. 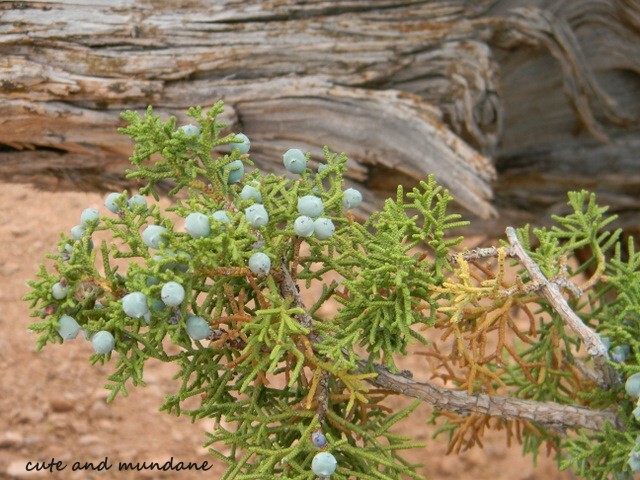 Atop the mesa in Canyonlands NP, there were Juniper tree / bushes everywhere. They smell quite nice too. 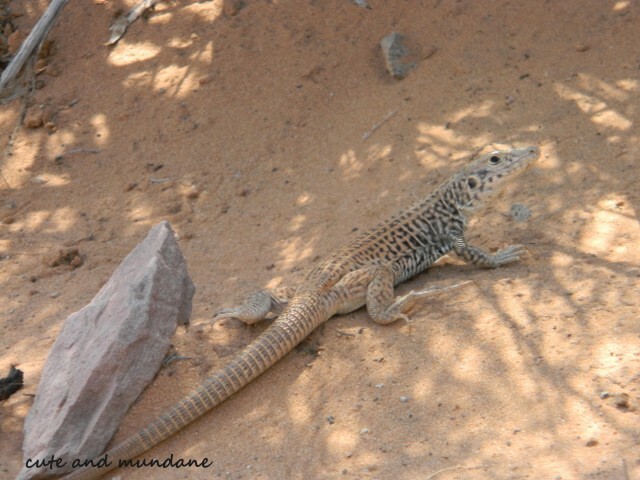 A lizard at Arches NP. These little guys were darting everywhere. These duo arches are called the North and South Windows. We climbed them at 12 noon, when it was 100F outside. The grade is not steep, but it's so much harder to hike when the sun is beating down on you. Once you reach the windows, however, it is marvelous to sit in the shade and enjoy the strong breezes blowing through the windows! Finally, I'll conclude with my "I was here" picture. I wore my favorite summer polish, Dior Vernis in Aloha as my pedicure. 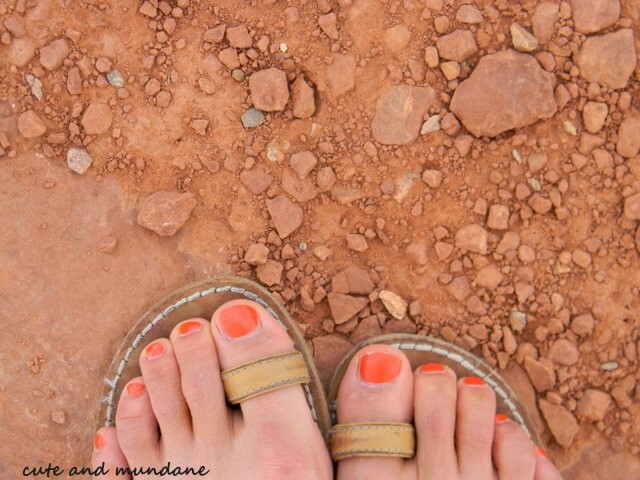 I thought the color fit in quite well with the red earth and sand found everywhere in the deserts. 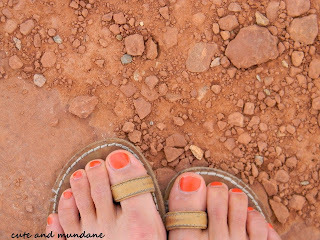 I apologize for the dustiness of my feet... the red sand really gets over everything. Thanks for checking out my adventures, I really appreciate all the nice comments! I'm back in the city, and unpacking and back to my usual routine. I watched Transformers: Dark Side of the Moon in 3D/IMAX yesterday, which was awesome. It's so cool to have grown up with 2D transformers cartoons and then see them later in their 3D CGI glory. But I digress. I'm curious, have you guys been to any national parks? Do you have any to recommend? My goal is to go to as many as possible during my lifetime! I hope everyone is enjoying the holiday (or non- holiday if not in the US =P) with loved ones. Wow, these photographs are fantastic! I can really see the beauty of these mountains! I haven't been to either of these national parks but I also want to visit as many as I can! I loved Yellowstone and Grand Teton but of course you've been there. I *really* want to go to Yosemite and will probably go there next. :) My parents just went to Denali in Alaska, I'm so jealous. Anyway cool pictures. I really liked the windows one! And the lizard, hehe. Wow! Thank you for sharing these amazing photographs. I loved that final picture!